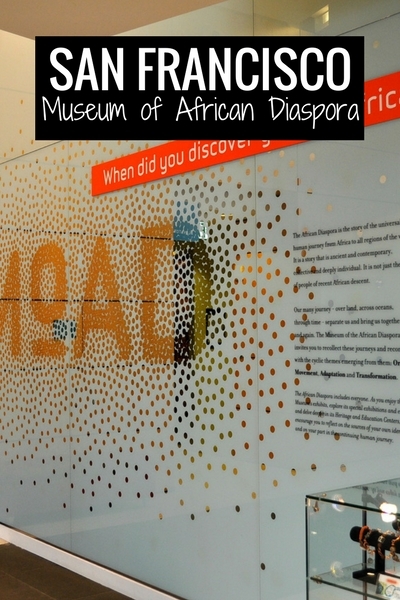 The African American Museum in San Francisco, officially called the Museum of the African Diaspora (MOAD), is one of our newer SF attractions. This fantastic museum opened in December of 2005 with fully interactive displays. You won't find historic artifacts or other such displays in their permanent collection. 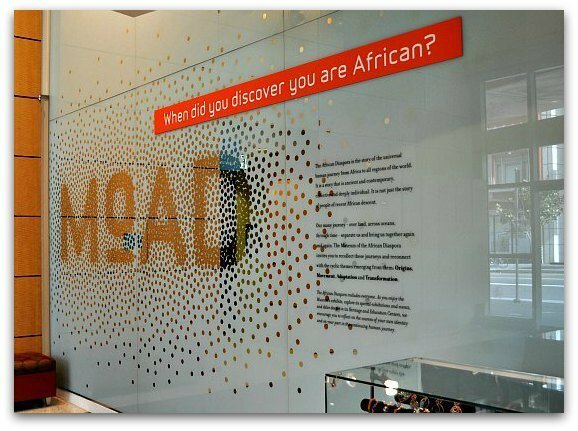 This modern exhibit teaches the story of the African Diaspora through videos, audio performances, and other interactive displays. The building that houses the exhibits is three stories tall. On the first story you will find the entrance, ticket counter, and gift shop. After paying your admission, you can either walk up the stairs or take the elevator to the top two floors. The 2nd floor houses the permanent exhibits. It includes three galleries as well as some interactive displays. The first gallery is called the Celebration Circle. It's a circular theater with seating around the outside. Here, you can watch an interesting film about celebrations that runs on a continual loop. It includes a series of interviews that touch on faith, births, and weddings, and how each interviewee traditionally celebrates important events. The film is really well done with colorful imagery. It lasts about 10 minutes. It's also a great introduction to the rest of the museum. When you step out of the Celebration Circle, you will enter a small area with about 10 interactive displays. One area focuses on food, a second on music, and a third on clothing. The food exhibit is a culinary journey of Africa and its people. It talks about everything from vegetables to coffee. There are three monitors with different themes, where you can press the button to activate a short video explaining the topic. The clothing area showcases a number of traditional and modern styles. It's all electronic, so the display continually changes showing different pieces. The final set of interactive displays are about music. You will find three screens with different types of music. Press a type of music to learn more. You can also press another button to hear a snippet of the music they are describing. The Freedom Theater is a small room where you can watch documentaries about African American history. It's unlike anything I've seen before. When you walk in, there is a TV monitor with a selection of 12 documentaries. You can scroll through the options and choose the one you want to watch. The films range in length from 5 to 85 minutes. They cover everything from slavery to segregation. If you walk in and another movie is playing, check to see if anyone else is in the room. If no one is watching the current film, you can stop the movie in progress, review your options, and start the one you want to see. This was a highlight of the visit to me. All the films are informational and interesting to watch. I spent a couple of hours in this theater during my visit. The last gallery on the 2nd floor is the gallery where you can listen to Slavery Narratives. This is also well done and so different from any other exhibit I've visited. The Slavery Narratives Gallery is where you can hear 10 slavery narratives about how people's lives were impacted by slavery. The stories come from books, movies, and journals written by slaves in the United States. Each one is introduced by Maya Angelou, but read by other people. The stories are very powerful. The atmosphere also engages you in the stories. The gallery is a dimly lit theater with seating on the outside. You walk in, take a seat, and listen to the audio recordings with few disruptions from the other people in the gallery. The audio loops, so you can come and go as you please. The entire set of narratives takes about 30 minutes. From here, you will walk straight out of the hall and through another theater to head to the third floor. The third floor gallery offers a more traditional museum feel. This is where they showcase their traveling exhibits. If they don't have a traveling exhibit, then this area is closed. Click here for a list of upcoming exhibits at this museum. Even though the African American Museum in San Francisco is small, you could spend two to three hours here. The films are engaging, the interactive displays are very well done, and the traveling exhibits are usually really interesting. You can get your tickets on the first floor before you enter the exhibits. They are closed on the following holidays: Christmas Eve & Day, New Year's Eve & Day, Memorial Day, Fourth of July, Labor Day, and Thanksgiving and the Friday after. You will find this museum at 685 Mission Street (blue star on the map). 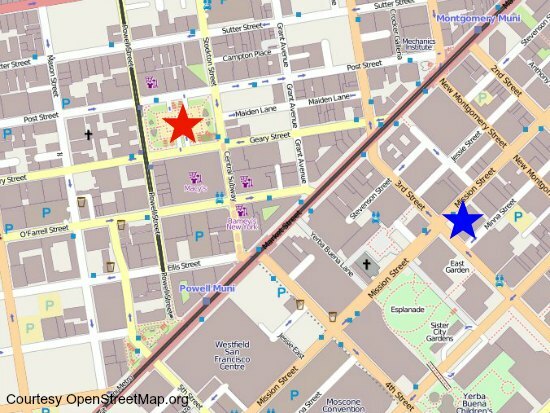 This is just a few blocks from Union Square (red star on the map) and one block south of Market and 3rd Streets. Before or after you visit, make sure you head across the street to take a look at the photograph displayed behind the staircase. It's an image of a little girl that was created with more than 2,000 photographs. You can take a close look at it once you are inside, but can only get the full view from the outside. The best time to take a look is when it's starting to get dark outside. This is when they put on the lights to illuminate the image. The African American Museum in San Francisco is located in the Yerba Buena Arts Area in the South of Market District (SOMA). You will find plenty of places to park nearby. It's also close to several other top museums in San Francisco including the SF Museum of Modern Art, the Contemporary Jewish Museum and the California Historical Society. Here are a few of the best places to find parking nearby. Parking rates can vary based on special events. The rates below are estimates to give you an idea on what it costs to park nearby. St. Regis Hotel: The closest parking is right around the corner from the African American Museum in San Francisco at the St. Regis Hotel. Parking here starts at $15 for the first hour and $10 per hour up to 5 hours. It's $54 for five hours and $61 for up to 24 hours. You will find it at 125 Third Street. Jessie Square Garage: Just a block away is the Jessie Square Parking Garage at 223 Stevenson Street. Rates start at $5 per hour, $25 up to 12 hours, and $35 up to 24 hours. Museum of Modern Art Garage: This parking garage is also close to the MOAD. You will find it just behind the SF Museum of Modern Art at 147 Minna Street. Parking rates here start at $4 per 30 minutes, $24 for up to 10 hours, and $35 for up to 24 hours. How else can I help before you visit the African American Museum in San Francisco?